Yesterday, while we were still in Mesa I decided that it was time for a new adventure. 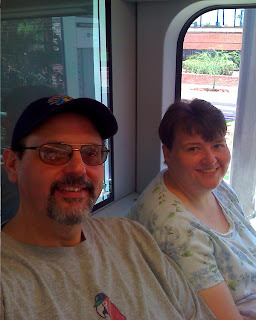 Patti and I were in the Phoenix valley, and it was Sunday, so we went for a quick ride on the Metro Link Light Rail. Just to ride it! Hey, you have to take your Disney where you can (that'll only make sense if you know me). 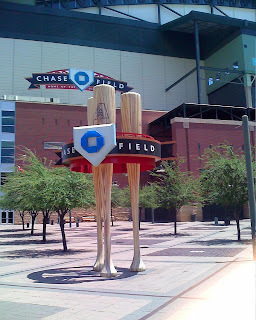 We rode it to Chase Field in downtown Phoenix, and then back into Mesa. We didn't even stop to take a look around. It was just a train ride, and as far as being a substitute for a Disney ride... well it was something to do. 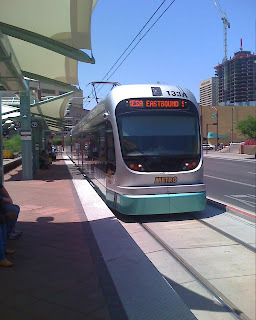 Having done that, and ridden the light rail, I can honestly say that I don't need to do it again just for fun. On our way back during this adventure some woman let her water break right there on the train. SOME PEOPLE!!! I swear... can't people do that sort of thing at home? Her husband jumped off of the train and ran to get the car when we got to their "Park and Ride" location. He seemed motivated to get off the train. I guess he was embarrassed... Serves em' right! On our way to town. 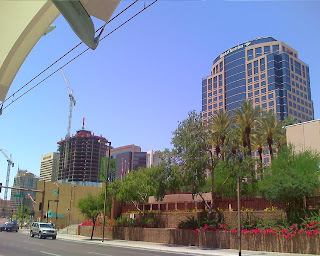 A picture of the bank building that owns my house for 10 more years, and that is Downtown Phoenix in the background... I know... "It's a Small World" it ain't. 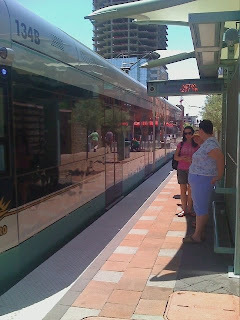 The train that delivered us from the 105 degree station right before things got messy. there's no letting about it!